One of the most famous stories of Hinduism is that of the Great Churning of the Ocean by the Devas and Asuras (Gods and Demons) in the quest for the Nectar of Immortality. This tale has deeper dimensions, capturing insights into the nature of existence that the ancient Rishis (sages) discovered in deep meditation. All of the great tales of the Vedas and Puranas have a multiplicity of insights which can be learnt be those who are willing to scratch beyond the surface. In the story, the Devas have lost their dominance and glory. Approaching Lord Vishnu for help, the Devas are advised to seek the Nectar. A plan is devised, in which the Devas need to enlist the help of their foes, the Asuras. 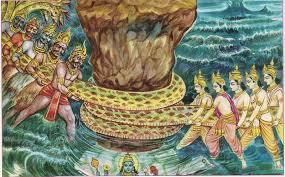 The Devas and Asuras use the divine serpent Vasuki as the churning rope for churning Mount Mandara, pulling the mountain back and forward, hoping to bring forth the Nectar from the depths of the ocean. The symbolism of the story is quite profound, displaying how “good” and “evil” are both necessary for progress to ever greater existence. The Devas are eternal consciousness forces of goodness, truth and beauty; the Asuras are negative consciousness forces of darkness, associated with lower impulses. These include ego, jealousy and uncontrolled desire that lead to chaos and the negative aspects of existence. Goodness, light and beauty alone eventually come to a stage where they halt progress towards ever greater evolution of consciousness, becoming self-satisfied and arrogant. The striving for ever greater heights, both in inwards and spiritual matters, as well as in worldly endeavours requires the duality and interplay of both the Devic and Asuric forces. When everything appears to be well, eventually the propensity to strive is blunted. It is by the continued presence of both the Devas and Asuras that the cosmic process is driven to ever greater heights. Thus, the Devas alone are too weak to complete the task of churning the ocean by themselves. During the churning, Mount Mandara begins to sink into the ocean and is in danger of becoming totally submerged. Lord Vishnu incarnates in the form of a giant turtle named Kurma, upon whom Mount Mandara was supported so that the churning could continue. In the process of the churning, fourteen types of treasure arose from the ocean, representing various beneficent aspects of existence, which could never have come about by the Devas alone. However, toxic poison also arises which threatens to engulf the entire existence. The poison is consumed by Lord Shiva, the underlying self-existant primeval consciousness by whom all evil is neutralised. Eventually the Nectar of Immortality appears, which represents the highest divine potential and glory of manifest existence. The Asuras gain the Nectar, but Lord Vishnu takes on the form of Mohini, the Enchantress, to trick the Asuras and ensure that the Nectar goes to the Devas alone. There is an underlying consciousness force of order and preservation that maintains existence throughout tremendous calamities. This is Lord Vishnu, the aspect of the Supreme Being who is the preserver and guider, always ensuring that the Devas eventually prevail, leading to greater heights after every period of hopelessness and despair. In truth, this story represents a process which never stops – look around us and you will see it in action!